Gunnar Nelson finally makes his return to the octagon after almost a year and a half out on the sidelines due to injury. His last fight was a rare loss to top contender Santiago Ponzinibbio where he got poked in the eye and knocked out shortly after. The stoic Icelander has been desperate to get back to the cage ever since and get back to finishing his fellow welterweights. He has a formidable opponent on his return which will be a very interesting match-up. Alex Oliveira has 13 UFC fights under his belt and only lost three of them. He is also coming off two brilliant wins this year – a submission over Carlos Condit and a TKO over Carlo Pedersoli. Both men are extremely talented and well-rounded so wherever this fight takes place will be a spectacle. Oliveira will hunt the chin of Nelson and with 13 knockouts to his name, he knows he has the power and technique to rack up his 14th. However, Nelson is a black belt in Karate and utilises this technique to bounce in and out of range and attack so he will be elusive with venomous speed providing a fascinating stand-up battle. They will both look to inflict damage on the feet to set up a finish and Oliveira will back his size and power to find the knockout. 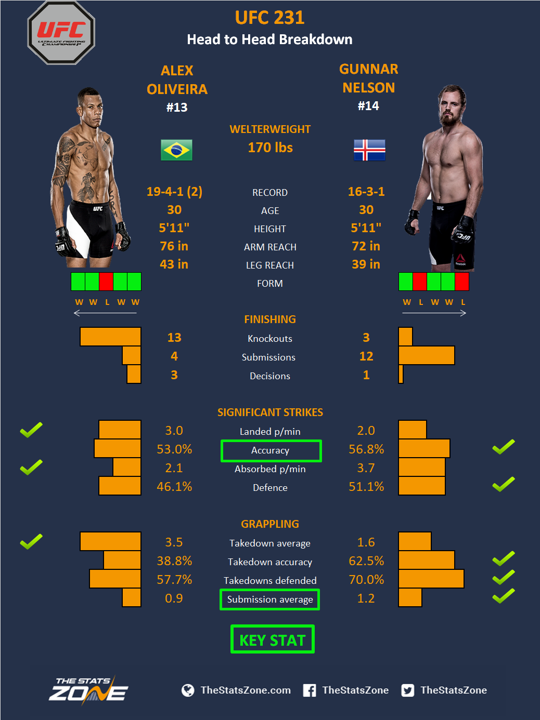 However, Nelson is also an extremely accomplished grappler and his technique is so fluid and at such a high level that size does not matter and this could easily be the difference against the Brazilian.